A savings plan as spontaneous and flexible as your life – WITHOUT any duration term or payment obligation. You can buy and sell at any time. We would like to reward you for your long and regular savings. Therefore, the longer you save for yourself, the more discounts you can get. After receipt of money your money is invested in pure 999.9 silver and you are the direct owner of your goods. With your personal access data, you have online access to your inventory 24 hours a day, 7 days a week, and 365 days a year..
By appointment you also have personal access to your goods stored in the high security vaulting facility at any time. Have you ever bought precious metals? Of course, you also compared prices? How much markup have you paid on the actual market price? We offer unbeatable purchase opportunities, where you get even more precious metal for your money! Clever customers compare the prices. Click on the image to learn more. With your personal online access you always have a complete overview of your savings. Your investment is available 24 hours, 7 days a week, 365 days a year. By appointment you can personally pick it up, have it delivered or have it transferred in the currency of your choice. Your goods are always bought directly from the best manufacturers. These are always LBMA certified. Thus, the authenticity and purity of the goods is guaranteed. Read more about our partner here. Your investment is in a private high-security vaulting facility with the highest security rating in Europe, so you can sleep peacefully even in times of crisis. Learn more about the high security vaulting facility and the storage fees here. The storage inventories are checked for correctness and completeness by one of the largest Swiss auditing companies, BDO AG. 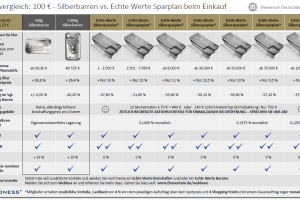 We store 15 kg silver bars of the highest quality 999/1000 from our partner Umicore. Find out more about our partner here. You invest in real values and real goods. Precious metals have had better returns over the last 10 years than most other financial products. Regular monthly payments make you independent of the current price of silver and ensure a favorable average price. Learn how easy it is, here in the video. So, set up a standing bank order and save in silver completely relaxed. Your investment in physical silver is tax-free after just 12 months of holding (e.g. in Germany). The storage fees are debited to you in grams exactly from your Real Value Silver Savings Plan monthly. You do not need to bank wire invoices, saving you precious time and money.